We have three Beautiful upcoming litters due in February. Ready for their new homes in April. 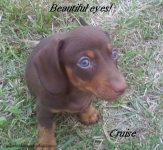 Possible colors are: Chocolate & Tan, Chocolate & Tan Dapple in short hair coats. English Cream, Shaded Cream, Black & Cream and English Cream Brindle in long hair coats. All puppies will come with their first two shots, dewormed, microchipped, vet health checked and genetic health guarantee. All puppies are AKC registered. Our prices start at $650 and will depend on color, coat, pattern and registration. Please contact me if you're interested in being on our waiting list for one of our upcoming litters! This site is about our Miniature Dachshund puppies that are available for their new homes and our litters that will be available soon. Most important it is about our own Mini- Dachshunds that play an important role in our lives. I have been breeding Miniature Dachshunds for ten years. I breed for conformation and temperment. I have my dogs tested according to the Bred with HEART Progam with AKC. I have taught lower elementary students for over fifteen years. I have used my skills of structured programs, positive reinforcement, and my love for children and animals. And empowered them into raising happy, healthy, well socialized Miniature Dachshund Puppies. We spend many hours each day with our puppies to insure that they arrive at their new homes happy and well adjusted. If you are looking for a good quality Miniature Dachshund Puppy. One that has a very loving desposition, at a quality price. Your search is over! Meet our first mini dachshunds that started our business, Rocky and Adrian. Our love for this breed started with this beautiful pair. Please feel free to view our site and contact us with any questions. 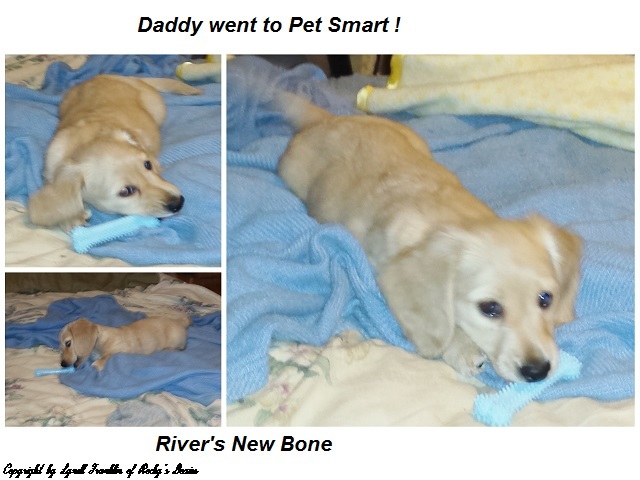 ​River is our newest addition to Rocky's Doxies. He is an English Cream. 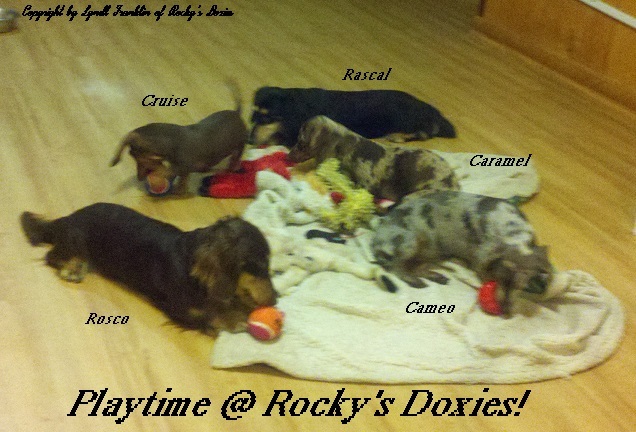 He is our new addition to Rocky's Doxies! All of our Dogs & Puppies are raised indoors and under foot ! Please see our Mothers & Fathers pages for more info on our Loving Mothers and Fathers.